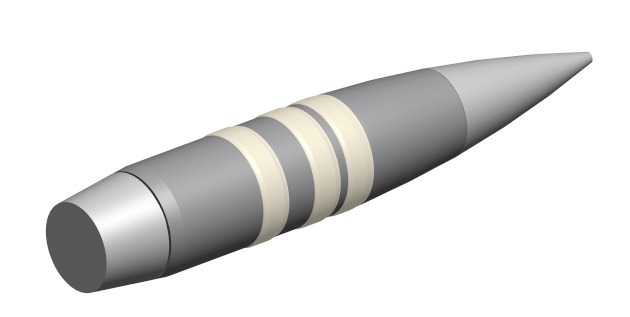 DARPA announced that its self-steering bullet program, dubbed the Extreme Accuracy Tasked Ordnance (EXACTO), passed another developmental milestone in late February. Per an administration release, and the video below, experienced and novice shooters alike were able to strike moving targets. And, in the case of expert shooters, able to hit actively evading targets as well. "True to DARPA's mission, EXACTO has demonstrated what was once thought impossible: the continuous guidance of a small-caliber bullet to target," said Jerome Dunn, DARPA program manager. "This live-fire demonstration from a standard rifle showed that EXACTO is able to hit moving and evading targets with extreme accuracy at sniper ranges unachievable with traditional rounds. Fitting EXACTO's guidance capabilities into a small .50-caliber size is a major breakthrough and opens the door to what could be possible in future guided projectiles across all calibers." DARPA engineers will reportedly continue to improve the ammunition's accuracy, though there is no word yet on when American snipers will begin fielding the rounds.